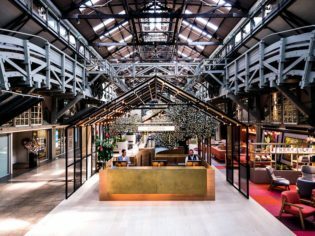 Set inside one of Sydney Harbour’s most recognisable structures, Alissa Jenkins checks in to see if the new Ovolo Woolloomooloo hotel befits its location. Have a shiny, happy day!” beams an automated voice down the phone, before I’m transferred to a real-life (albeit slightly less upbeat) receptionist to confirm my check-in time. 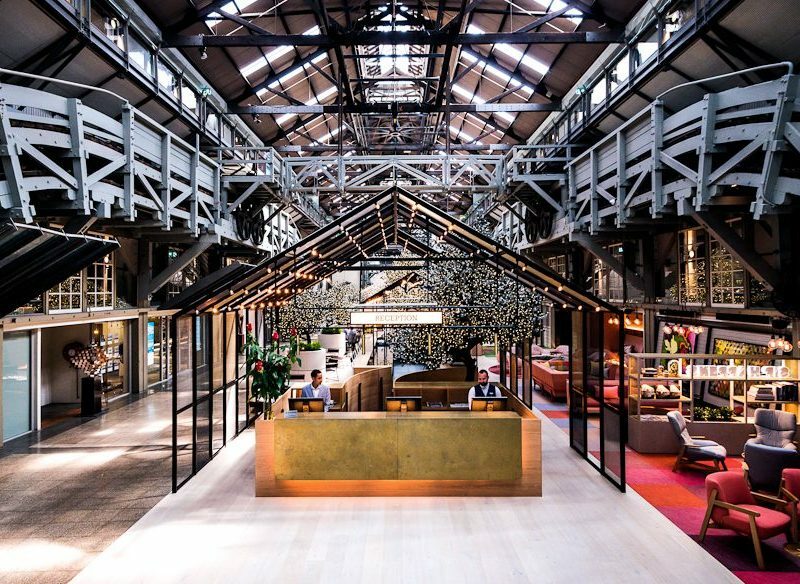 It’s a promising taste of the fun and frivolity to be had at Ovolo Woolloomooloo – the third outpost of this Hong Kong hotel brand to open in Australia. Priding themselves on cutting-edge technology and ‘shiny happy people all around’ as the mission statement depicts, Ovolo seems a curiously contemporary choice for such a heritage-listed landmark. Just a couple of headlands from Sydney Harbour’s best-known architectural icons (a certain bridge and one impressive house), the hotel resides inside Finger Wharf on Woolloomooloo Bay. Throughout its 100-year lifetime it’s been the longest timber-piled wharf in the world, a major wool and cargo dock, a derelict structure saved from demolition, before resurfacing as one of the inner city’s most exclusive marina addresses. Housing high-end restaurants and plush apartments, the wharf has also laid claim to many hotels over the years, and in its latest reincarnation now waves the Ovolo flag. Arriving at Finger Wharf, its teal-trimmed Edwardian façade remains intact, while inside the hotel speaks to a very different time. Rowdy arcade games, fairy lights, cheeky artwork and colourful seating configurations smack of 20-somethings let loose in Ikea. Minus a few interpretive signs dotted about, there’s minimal reference to the building’s past. With the car valet-parked and check-in complete, we continue to our ‘Deluxaroo King’ suite. A sprawling light-filled space greets us, with views over both the harbour and lively neighbourhood. Its neutral colour palette pops with splashes of red and a Splice-yellow lounge. While the Smart TV and in-room iPad (which doubles as compendium) do get brownie points, it’s the king-sized cloud/bed that takes the cake, even if the fabric headboard features the nether regions of retro surfers. The pool, however, doesn’t offer the same shiny newness. Weathered plywood floors the outdoor seating area, while timber floorboards surrounding the pool inside are showing wear and tear. The bathrooms – though well fitted-out with flattering lights and sumptuous Appelles skincare products – have wet towels dumped on the floor and hair in the sink. But worst of all is the lack of pool towels for guests. I call reception (friendly as they are) beforehand to make sure there are towels available, but we arrive to find none. Forty minutes and three additional phone calls later, towels finally arrive. But now happy hour (another admirable freebie) has begun in the lobby’s Lo Lounge, where complimentary drinks and canapés seem much more enticing. We arrive to a humble picnic-like spread comprising carrot sticks with dip and calamari rings, and a similarly modest drinks menu. Encouragingly, it extends for two hours, while the dinner menu (expect upwards of $25 per share plate) underwhelms, so we opt to dine out. While the hotel design is undoubtedly shiny and Ovolo staff seem unwaveringly happy throughout our stay, it’s more a matte-finish, contented day. Verdict: Youthful in its design, vibe and service glitches, hopefully it improves with age so it’s as faultless as the rooms and location. We rated: The bed, oh the bed, and all the lovely little complimentary extras make it an extra special stay. We’d change: The food on offer and the upkeep of the pool weren’t up to scratch for a self-proclaimed five-star establishment. Notes: We paid $319 for a King Deluxaroo suite, but landed an extra $50 for valet parking that wasn’t identified on arrival. But we can forgive that for all the other freebies.